Twelve Corriedale exhibitors from four States entered sheep for the 2003 ASBA Show on July 19 under Judges, Mr. Peter Baker who judged rams while Mr. Richard Archer judged the ewes. Mr. Arthur Pederick judged the National Pairs. 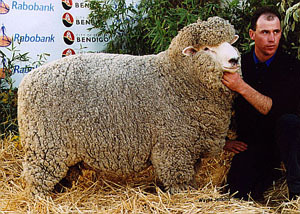 Senior Champion Ram and Grand Champiopn Ram and Supreme Champion Corridale at the 2003 cAustralian Sheep and Wool Show, Bendigo, Victoria. Exhibited gy G. & S. & R. Foster, Haven Park, Casterton, Victoria. G. & S. & R. Foster – (Haven Park) with their Grand Champion Ram.